PRZYGODA CZŁOWIEKA POCZCIWEGO, The Adventure of a Good Citizen, an irrational humoresque (1937) by Franciszka and Stefan Themerson, 10 min., 35mm, with English subtitles. All of the 1930s films by the Themersons were lost during the war. 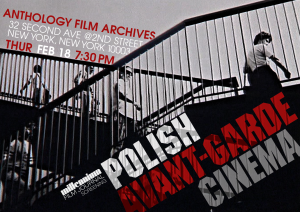 Around 1960 a solitary, heavily-worn copy of this film discovered somewhere near Moscow found its way to Warsaw, and then to the Film School in Łodź. It is said that when Polanski was a student there he made his Two Men and a Wardrobe as some sort of homage to it. The Film Archive in Warsaw later made a 16mm reduction print of it, and the version in the LUX collection is a print from this. The lyrical sequence towards the end of the film, in the woods, with birdsong and falling leaves that appears in negative was originally hand-colored. The film is a fable of escape from convention, a social satire delivered with such delightful and homogeneous lightness of touch that it’s hard to believe the hostility that greeted the first screening in March 1938. But like much of their work in all media, The Adventure of a Good Citizen questioned the status quo, and Stefan understood the weight of that. When the hero of the film walks backwards out of his office and down the street, he is pursued by protesters with placards proclaiming ‘Forward march!’, ‘Walking backwards is wrong!’. The good citizen’s dream-like escape from urban conventions into a natural world, where he flies free as a bird, must have appeared in 1938 more dangerously subversive than we can appreciate today. In May 1960 Stefan Themerson was told of the film’s survival in a letter and he wondered, in his reply, whether its meaning had also survived. KINEFORMY, Kineforms (1957) by Andrzej Pawłowski, 6 min. 45 sec., DVD. This film, made by a painter and sculptor, is a filmed projection of moving objects displayed on the screen with a magic lantern based on a concept of kaleidoscope, specially made by the filmmaker. Originally Kineforms was not a film but an improvised projection shown at the Cricot 2 theater of Tadeusz Kantor, it is an attempt at capturing motion as a kinematic sculpture recorded on celluloid. The original 35mm film copy is in such bad condition that it cannot be projected anymore, the only available format is its restored digital copy on DVD. TEST 1, Test 1 (1971) by Józef Robakowski, the artist’s digital copy, 5 min. 13 sec. The film is an experiment in the perceptual possibilities of sight and hearing made by one of the founders of the Film Form Workshop, who presently is a teacher at Lódź Film School. Test 1 was made on 35mm magnetic tape with the artist scratching images directly into it with a cobbler’s puncher to create illusions of a complete blackness and whiteness not possible on overexposed celluloid. Unfortunately, the original copy is not available because it requires a special projector to screen it, however the artist has provided a DVD copy made from his original. NOWA KSIAŻKA, New Book (1975) by Zbigniew Rybczyński, 10 min. 15 sec. 35mm, with soft English subtitles. This film was made by the Oscar recipient (Academy Award for Tango, 1983) and one of the founders of the Film Form Workshop. The narrative of the film is quite banal, it is the story of a book passed from one situation to the other. 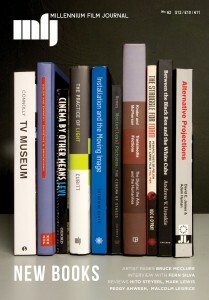 The book’s story connects nine separate subplots taking place simultaneously on nine screens. However, Rybczynski’s idea had once and for all changed the form of filmic narrative, it is an experiment about the filmic time-space ahead of Timecode (2000) by Figgis by 25 years. STOLARZ, The Carpenter (1976) by Wojciech Wiszniewski, 13 min., 35mm, with soft English subtitles. This fictionalized documentary features the invented character of a carpenter and is instilled with a feeling of authenticity by intertwining the carpenter’s imagined biography with found footage of historical events. However, by employing continuous repetition of shots, the authenticity of their historical value loses its credibility. 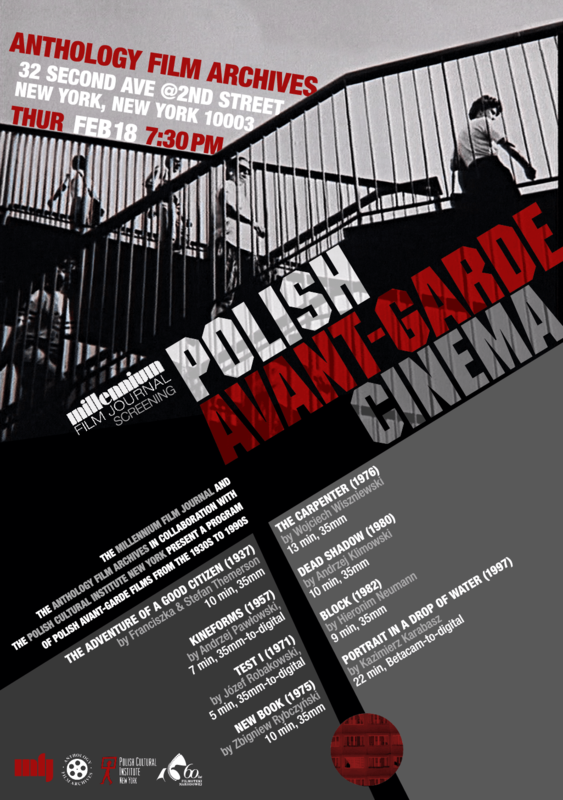 To further distance viewers from the illusionary authenticity of a documentary, Wiszniewski uses well known VO of Jan Himilsbach (amateur actor/writer, originally a stonemason, laborer and garbage collector) who provides unrehearsed, amateurish sounding commentary while a different actor performs the carpenter’s role. MARTWY CIEŃ, Dead Shadow (1980) by Andrzej Klimowski, 10 min 17 sec., 35mm. Klimowski is a well-known graphic artist and art teacher at the Royal College of Art. In 1968-72 he studied sculpture and painting at St. Martins School of Art in London and later at the Academy of Fine Arts in Warsaw where he meet his collaborator on Dead Shadow and future wife, Danusia Scheibal. This film, a mixture of live action, animation and found-footage, is the story of an old man who contemplates the passage of time and loss. The images, intertwined with sounds of Mozart’s Requiem and a lack of textual narration, are susceptible to any interpretation. BLOK, Block (1982) by Hieronim Neumann, 8 min. 48 sec., 35mm, soft English subtitles. Neumann, after graduating from the Academy of Fine Arts in Poznan, became an assistant to Zbigniew Rybczyński. He is a Professor of animation at the University of Art in Poznan and the Academy of Fine Arts in Warsaw. The film, a theatrical documentary, appears to be a single voyeuristic shot depicting life in the various dwellings of an apartment building. It is a theatrical impression of the everyday life in a busy housing project, where numerous events take place simultaneously. Whether they are banal or outstanding, funny or tragic, it does not matter, life goes on. PORTRET W KROPLI, Portrait in a Drop of Water (1997) by Kazimierz Karabasz, 22 min., Beta Video, DVD, English subtitles. The artist graduated from the Lódź Film School in 1956 and he still teaches there.